In 1998, Bishop Kinney wrote a Pastoral Letter on Catholic social teaching, As I Have Done for You… He writes, “Since that time, many changes have occurred; however, Catholic social teaching never changes. In light of the many societal and diocesan developments over the past 12 years, I think it is important to revisit this pastoral message. 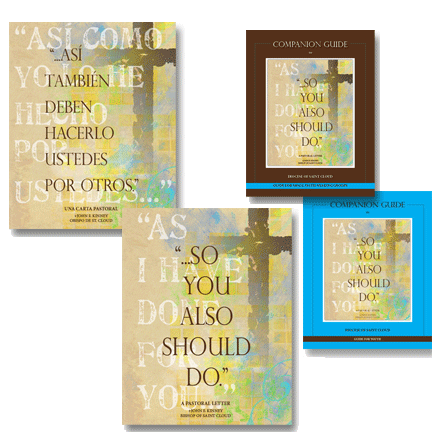 “The new Pastoral Letters are available in English and Spanish to order by calling the Office of Social Concerns at (320) 229-6020. To aid in the ‘revisiting’ of this important Church teaching by all people in the diocese, and stir conversation about the important issues of our day found in the new Pastoral Letter, Companion Guides are available, written for differing age groups, with prayers, discussion questions, and activities. A Companion Guide for Adult Small Faith Sharing Groups and a Companion Guide for Youth Leaders is available. Download the College Companion Guide.